Well, what a week it´s been! Getting back from our holiday and trying to re-establish a routine with gardening, chickens, dogs, cooking, work…but all of it fun. Then, much to my surprise, I was nominated for the Liebster Blog Award by the lovely Cecilia over at The Kitchens Garden and Mandy at The Complete Cookbook. You don´t have to make any lists or link to any blogs with this one, just nominate 5 blogs you admire who have less than 200 subscribers, and who you feel should have more! Please feel free to accept, ignore, pass on, enjoy…but for those of you reading this, do check them out, I think you´ll like what you see! 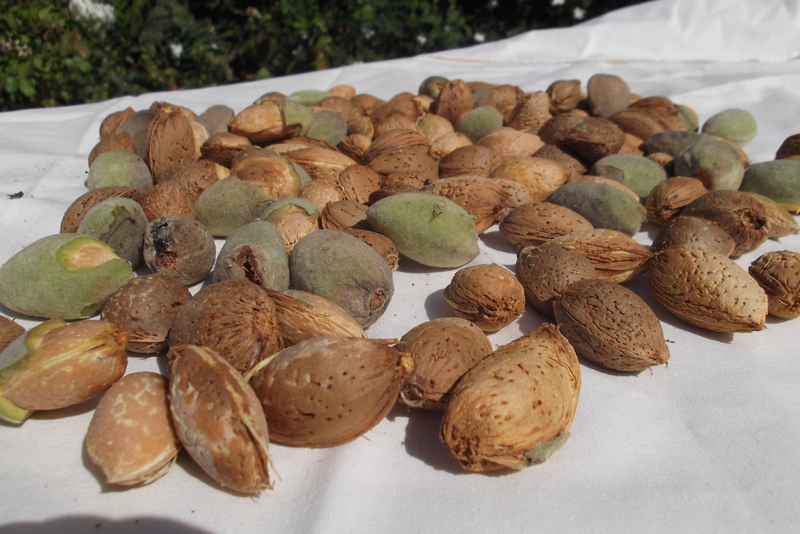 Now…a quick look at our almonds. We had so much rain here in the spring that one of our two almond trees lost all its blossom and the second one only managed to hang on to a few flowers. Such a shame. When we got back it was time to pick our “bumper “ crop. As you can see, there really wasn´t very much picking to be done. We didn´t need to bring extra workers in! Quick, bring the wheelbarrow...I can´t take the weight! The almonds are covered in a green velvety casing. We peeled this off of most of them as we stood by the chicken shed. We left them in the sun for a few hours which helped us get those stubborn little “coats” off. And that was it – one evening soon we´ll open a nice bottle of wine, get our stinky cheese out and have an almond cracking session. Fingers crossed for a better harvest next year. Wow, how cool to be given so much love – 4 awards – YAY! Well done! I hope you get more almonds next year! Congratulations on your well deserved awards!! Those fresh almonds must taste so good!!!! I loved your post title!!! Well, we only grow them because there were two trees in our liitle olive grove when we bought it. I´d love a walnut tree but they get SO big. The chicken shed is made out of scraps that we “recycled” – all from the local dump, so not very posh! Stinky cheese rules! Oh I should put that on a T-shirt. Congrats on the awards, well-deserved. These almonds are making me hungry! How about a scratch and sniff t-shirt?! Wow, almonds. I saw them growing in Provence when we were there in the spring, and wondered how long it took them to ripen… They look like peaches – all fuzzy on the outside. Very cool! We´d normally have a whole lot more, but not this year. They are pretty from start to finish (blossom to green shell) and great to eat! Congrats on your awards! Your nuts look lovely!! Congratulations on the well-deserved awards! And thank you so much for passing one on to me – I’m flattered and very pleased that you like my blog, but I hope you won’t mind if I don’t pass it on. I decided when I began blogging that I wouldn’t participate in these challenges and awards. I broke that rule once recently, as you know, when you kindly challenged me, but I won’t this time. I feel a bit guilty, but I’m sure you know that I value your comments and love your blog too. Oh, and the almonds look great, even if there aren’t many of them! Thank you and no worries about the award – you must do exactly as you please, it´s yours! (And they can end up going round in circles). Our poor old almond trees, they took a real bashing in the rain this year. Oh well, it´s good for the olives. I´ll save you a few nuts and we can go mad with them when I am in London! Wow! A bucket of almonds and a bunch of awards — all well-deserved. Congrats to you on both counts. 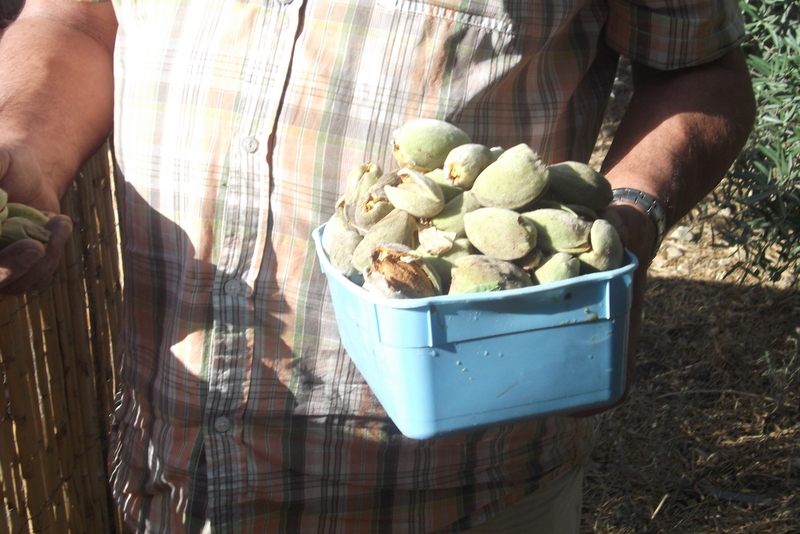 Thanks so much – shame there weren´t a few more almonds…next year hopefully! Congrats on the worthy awards. Enjoy those almonds. Thank you – we´ll try not to gobble them all up at once! He hee – and thank you! 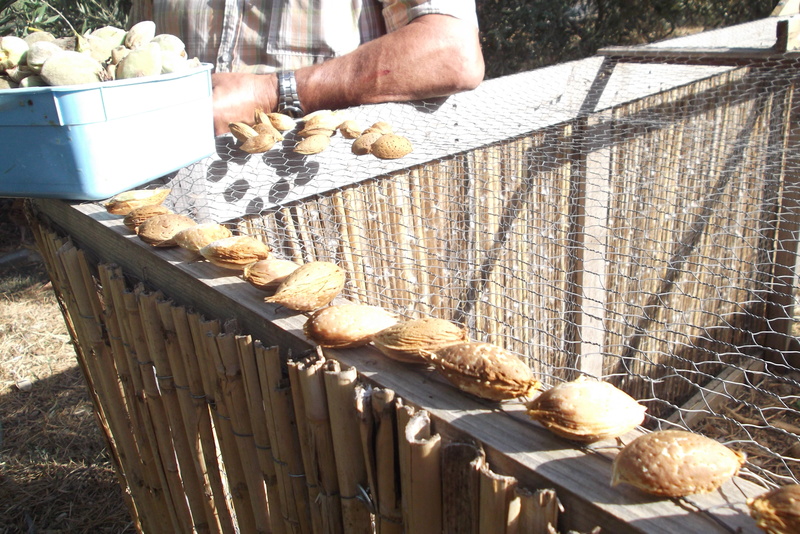 Ys, the chickies had great fun playing with and pecking at the almond casings! Muchas gracias por la nominación Tanya! Como siempre, es un placer venir y leer tus posts. Aunque pequeña, la cosecha tiene muy buena pinta. Enhorabuena! De nada – lo mereces mucho. Y la cosecha, si, muy pequeña, pero rico! congratulations on the deserved awards…sending and sharing the love for the weekend around wp has been fun, and a great way to get enticed to meet some of the great bloggers out there!Your almonds look great and have a great evening of wine, nuts and stinky cheese….just the way I like it! Sweet indulgence! Thanks Yvette – it is a good way to see blogs you normally wouldn´t have visited or just haven´t come across yet. Looking forward to our wine/nuts/stinky cheese evening! I am in love with your huerta!! What doesn’t it have?! And thank you for the nomination, I greatly appreciate it!! There is a huge difference in taste – shame you can´t get them any more. Thanks for visiting! A bottle of wine and an almond cracking session?? Sounds like a party to me!! 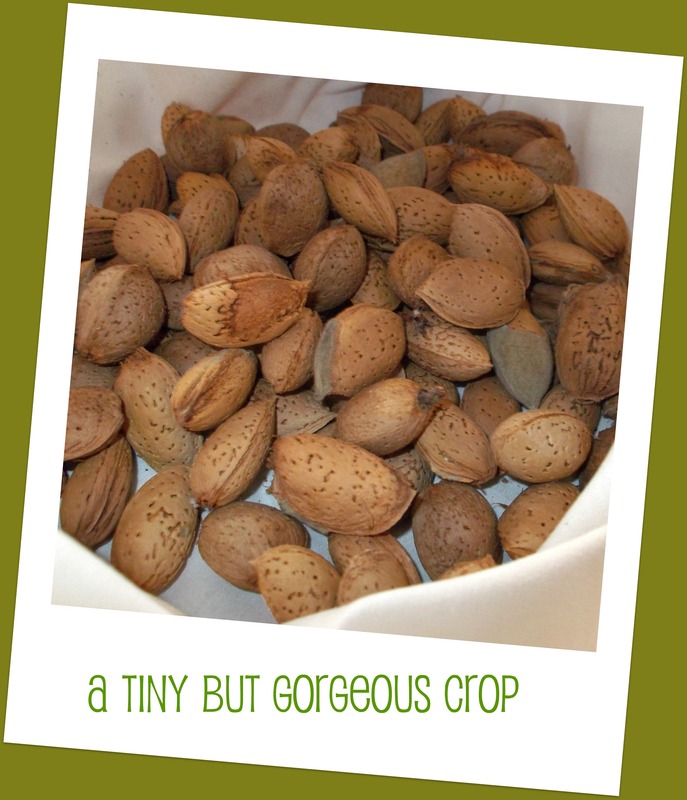 I had no idea about the growing of almonds…I feel like a city chick who just learned something new! Your awards are all so well deserved; I’m always looking forward to your posts!! You´re right – a cheese (nut) & wine party! Congrats on the awards! Those almonds look delicious. Nice that you didn’t have to bring extra workers in! All the extra cost we would have had! Thank you – all pretty surprising! Well done!! You deserve those awards. 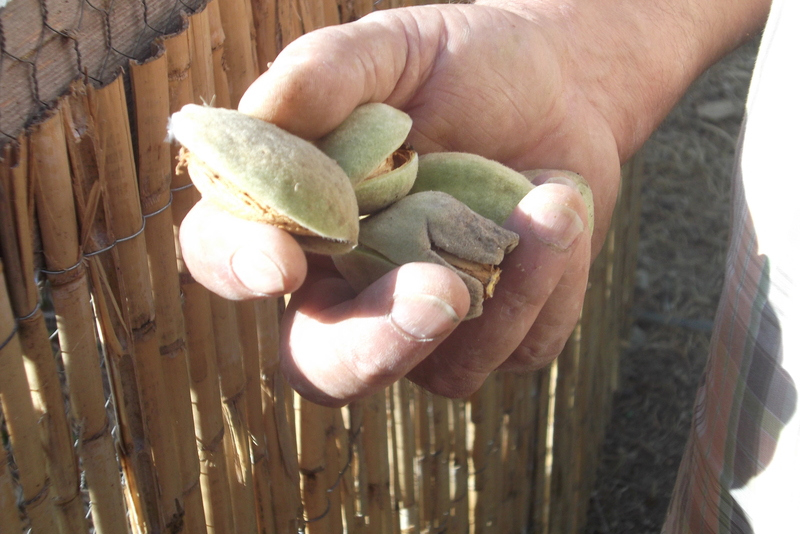 I love those almonds, such a privilege to reap those! Once, in another lifetime, in another part of SA, we also had almond trees, and those photos of yours brought back such memories! Thank you. Thank you so much! You made me smile with your comment about the bougainvilleas. Big Man and I love them so much but have struggled to grow them. The photo was taken in Cordoba but finally this year, after moving a plant and one of our dogs trying constantly to dig it up, it has taken off! I think we were treating it too nicely…. :) Do publish a picture of yours, would love to see it! I thank you most humbly! Hi Olga and good to “see” you again. Many thanks for your lovely words – I do so enjoy writing my blog, I guess it´s natural that part of you is visible to the world in it! Ah thanks Sawsan – they almonds are pretty good…well, very good actually! Ah thanks RaeDi – shame about the little harvest, but luckily we have lovely neighbours who have given us more!